Great Taste Magazine 2008 March April Issue features Chef Jack Daniel Robertson and culinary news, tips, recommendations and recipes from Orange County restaurant chefs. Going Green is on the minds of more and more people these days but many chefs worry that going green will hamper the taste of their food. However it is possible to save the environment while still savoring food and in this issue of Great Taste we shine a light on a few simple ways to go green. We give you the full run down on everything from changing to energy efficient light bulbs to the role food plays in the popular fuel alternative, bio-diesel. Chef Jack Daniel Robertson is certainly on the green trend as he runs Tantalum Restaurant in Long Beach. 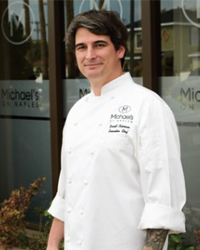 Born and raised in the Orange County area, Chef Jack realized he wanted to be a chef while he was in business school. 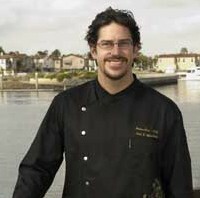 He dropped out and started attending Orange Coast College’s Culinary School where he grew to become the innovative chef he is today. He was kind enough to share his story with us as well as a delicious recipe for White Marble Double Cut Pork Chops with Cornbread Sausage Stuffing, Apple Mojo and Mache Greens. We continue our delicious indulgence in the world of Pork Chops in Sur Le Menu with some of the best Pork dishes from great restaurants around Orange County. Coffee and teens may not be two things you would normally associate together but as the coffee trend grows ever larger, teens are getting on the cafe bandwagon. Just ask Aroma Cafe in Studio City, who is featured in our Trends section this month. Aroma is so hip, they boast a crowd of mostly under 20s and even a celebrity or two. This issue marks a first with our new beverage correspondent Steven F. Ackad. In every issue he will be offering up what’s new in the world of drinkable delights. We herald in his arrival into the Great Taste family with a look at his background and the kind of stuff we can expect to see from him in future issues. Dining is a complete experience. If the service is terrible, just remember the restaurant industry is competitive and your business will be appreciated elsewhere.